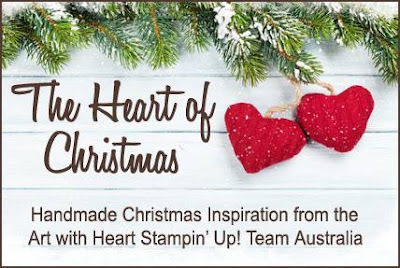 Hi everyone, we are up to week 2 with our inspiration Christmas cards from the Art with Heart Stampin'Up Team Australia. You can use almost any stamp set to make it Christmassy. 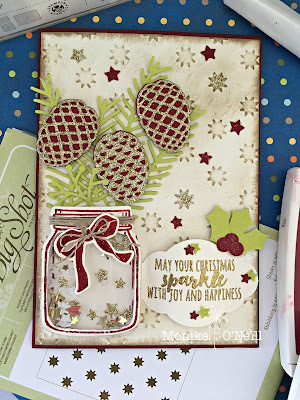 So today I have made a shaker Christmas card and used two stamp sets. 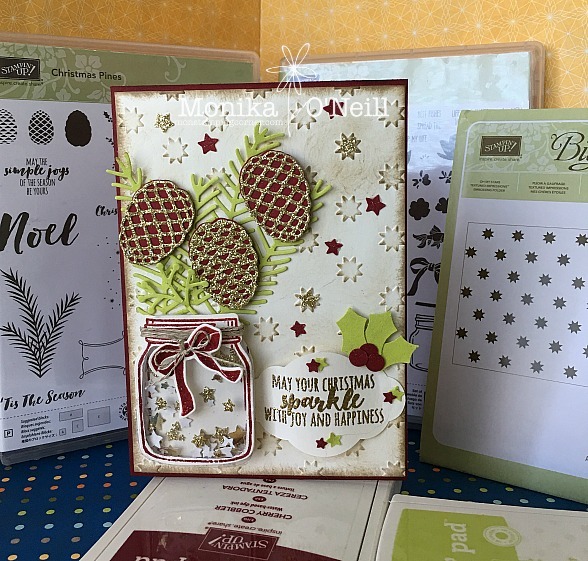 Christmas Pines Stamp Set & Pretty Pines Thinlets, Jars of Love Stamp Set & Everyday Jars Framelits. 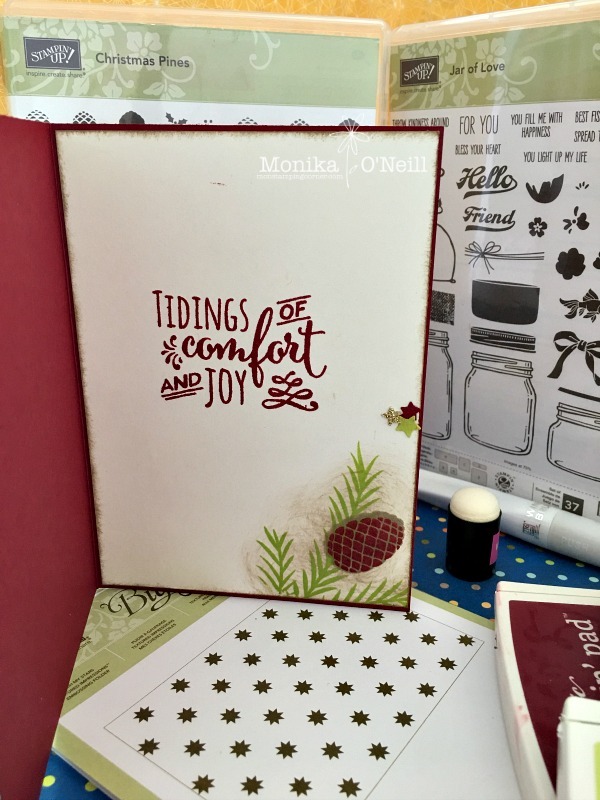 The card Base is Cherry Cobbler, the front mat is Very Vanilla Card and ran through the Big Shot using the Oh My Stars Embossing Folder and lightly sponged with Crumb Cake, I also sponged the edge of the card too. 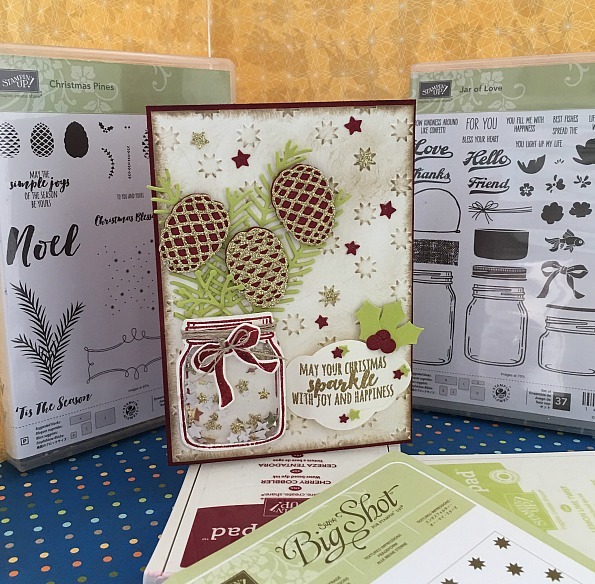 For the pine leaves I used Lemon Lime Twist card stock, and the same colour for the Holly Leaves using the Holly Berry Builder Punch. To make the shaker jar I stamped the small jar and embossed it with Cherry Cobbler ink pad using Clear Embossing powder (stamp with Versamark first then onto Cherry Cobbler ink pad and onto your card stock sprinkle with clear embossing powder and using heat tool to set) then I cut out the centre of the jar and set aside, now cut out the large jar and just trim it so you cant see it underneath the small jar, I used the Foam Adhesive Strips and cut them in half, it is a bit fiddly but not too hard and add window sheet. I embossed the Bow with Cherry Cobbler ink pad (same technique as above) and used linen twine wrapped several times around the top of the jar and tied a small bow. The sentiment is from the Christmas Pine stamp set and embossed in gold and used the Pretty Label Punch. The pinecones were cut out of Cherry Cobbler underneath and Gold Glimmer Paper. For the inside of the card I used Cherry Cobbler ink pad and the greeting from Christmas Pines stamp set. And sponged some Crumb Cake on bottom of card and used Lemon Lime Twist ink pad to stamp leaves, cherry cobbler for the pinecone and crumb cake for top layer, I also used Wink of Stella on the front of the card on the Holly & Berries. Hope you enjoyed today card. If you have any questions I will be happy to answer them. Below is a list of products that I used.